This plugin makes it easy to switch night mode on and off for custom themes. 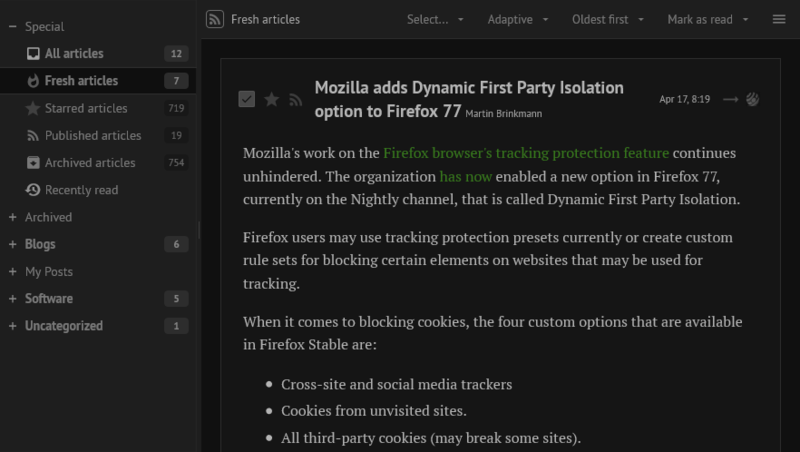 Normally, the menu item to toggle night mode only controls the default tt-rss theme, no matter what theme you have selected. This plugin checks if the active custom theme has a themes.local/[theme]_night.css variant and enables/disables it. If there’s no such file, the plugin will revert to the default behavior (and use the default theme to toggle night mode). Alternatively, you can just rename or create a symlink to your favorite night mode theme with the name of your day theme +_night.css. @ltGuillaume I will try it later, and report back! Thanks!